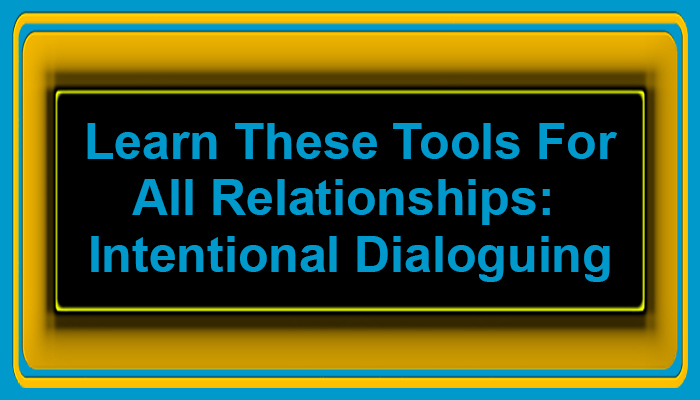 Years ago my husband, Gary Loper, Twitter Expert, Life, Business and Social Media Coach introduced me to a new way of dialoguing, Imago Intentional Dialoguing. Intentional dialogue is a healthy way to communicate, especially in times of conflict. The basic structure consists of some simple steps that when implemented they will foster an open, conscious and positive relationship. Intentional Dialoguing is ‘Active Listening’, born out of Imago Therapy. The breath of Intentional Dialoguing is mirroring, validating and empathizing with the other person’s feelings. Harville Hendrix, a maverick in his own time, captured this extraordinary process to create better communication skills. The book, Getting the Love You Want: A Guide for Couples builds upon these specific tools, techniques for communicative skills along with explicit exercises to foster growth and change. Although the book’s title suggests Couple’s Intentional Dialoguing, the tools can be used in other relationships both personal and business, with our parents, children, friends, and business associates. Embracing these techniques will take your relationships to a more meaningful level. When we keenly listen to others we awaken a part of ourselves, to be present, active, supportive and loving. STAY FOCUSED — It is important that you focus ALL of your attention on the present moment, on the Speaker. Focus on the speaker rather than allowing your mind to wander. When our mind begins to wander essentially we begin to play our own movie, and become lost in our own thoughts, feelings, emotions and visual images. When we are absorbed in our own thoughts, we display an attitude of self-importance rather than valuing the other person’s experience. LISTEN ATTENTIVELY — Resist the temptation to INTERRUPT. Interruption is a sabotaging mechanism. It displays to the speaker your need to be heard first, and lacks regard and understanding. As expressed by Harville Hendrix, the speaker has to be fully validated, understood and empathized before switching the conversational platform. BE NON REACTIVE IN YOUR REACTIONS, DON’T TAKE IT PERSONALLY — Listen without reacting to the speaker’s thoughts, feelings, emotions, tone, and body language. IT IS ABOUT the SPEAKER’s experience. Remember to listen with the HEART. Be KIND. Buddha’s gentleness can be observed in the following dialog. In his interactions with an individual who appeared belittling, difficult, harsh and unkind, when asked by one of his students how he could be so kind to such an unkind individual, Buddha replied … “when someone offers you a gift and you do not accept it then the gift is theirs”. It was about the individual. Buddha never took ownership, he simply listened. Always, it is the speaker’s experience. EMPATHIZE with validation and understanding — it is not about offering your own narration, as if to ‘top’ their story. It diminishes their experience. It may appear to be a caring reflection; however, simply put, it is a manifestation of “wound bonding”. It deflects the speaker’s experience and creates self-importance. AGREEMENT is not necessary — ONLY acknowledgment is relevant. Disregarding, not acknowledging the speaker’s words, only negates their experience. Your support should focus on a feeling of safety, security and clarity for the speaker. REINFORCE and CLARIFY — NEVER JUDGE. Judgment creates another dilemma, your observation and analysis of the situation lays out a picture of criticism, and dis-empowers the speaker and minimizes who they are. Judgment only reinforces FORCE instead of allowing the speaker to find his or her POWER. ALWAYS REFLECT — NEVER try and fix the problem. One of the quickest manifestations to stopping the flow is to offer a solution, a quick ‘Band-Aid’ fix when the speaker simply wants to be heard. Your part is to aid with LEADING QUESTIONS rather than answers. The speaker needs to find his or her solutions, a method of SELF-EMPOWERMENT. Finally, listening is a learned skill, a tool that can be taught and acquired with desire, repetition and reinforcement. It is the most effective manner to hearing what is truly being said.